Yesterday was a special day at May Dreams Gardens. These Turkish Glory of the Snow, Chionodoxia sardensis, were starting to bloom. I planted them last fall, scattering them here and there through out the front flower beds. They are small flowers, so you can't see them from the street; I can see and enjoy them as I walk around the garden. 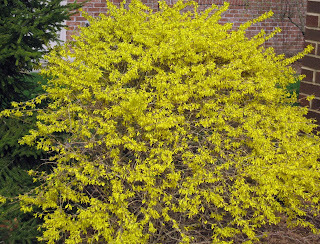 But you can sure see this Forsythia 'Gold Tide' from the street. It was just beginning to bloom last Thursday, and now it is screaming with yellow. I've told myself for several years that once it is finished blooming, I need to dig it out because it is crowding a nearby spruce, Picea orientalis 'Green Knight'. But then it blooms like this and I decide to let it stay there 'one more year'. I'm not committing to moving it this year, either. Look at it! Could you? 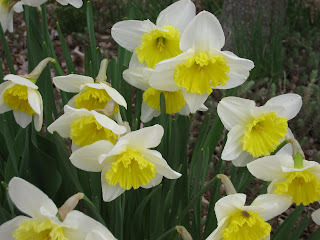 Daffodils have started blooming all over the place, both in the front and back gardens. I've long since forgotten the names of the varieties of daffodils, so last year I just gave them my own names. I feel like they should have new names this year, so instead of "Fried Egg" for this one, I think I'll call it "Austin Memories". All the daffodils are blooming several weeks later than they bloomed last year, by the way. 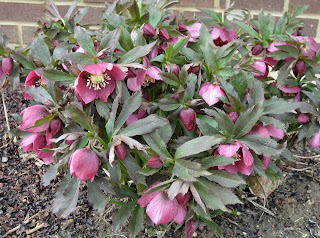 Moving on, because this post is really about the lawn, here is another Helleborus blooming. And there beneath the blooming Star Magnolia, Magnolia stellata, is what made the day a special day. Under clear skies with the temperature hovering around 70 degrees, I got to mow the lawn for the first time this season. Yes, I'm a gardener and I still like to mow my lawn and I'll admit it. I am a Lady of the Lawn. I enjoy the exercise. I feel blessed to have the strength and stamina to mow the lawn each week or twice a week if I am lucky and the grass is growing quickly. I like the look of the lawn next to the flower beds. I like to walk the labyrinth of the lawn to help me think things through, provide time to solve complex problems, clear my mind of my troubles. So I celebrate the first mowing of the season. It is my one eccentricity, I guess, unless you are counting the hoe collection as an eccentricity, then I'd have two. Or maybe three if you count all the gardening geek traits as one. But I'll admit to no more than three eccentricities. Anyway, to celebrate mowing the lawn yesterday, I wore my new hat that I won at the spring fling and broke in a new pair of old sneakers that have been promoted from everyday wear to lawn mowing. I "twittered" that there were speeches and a ribbon cutting ceremony, just like when I harvest the first tomato. There really weren't any speeches or ribbon cutting ceremonies, don't believe everything on Twitter, but it was fun to think about the first lawn mowing of the season being such an important event that it deserved some pomp and circumstance. Are there any other gardeners who will admit to being "Ladies (or Gentlemen) of the Lawn? Beautiful! I'm still waiting for the snow to melt. Seeing your pictures is a glimpse of spring we aren't getting yet. I am busy planting up the entire garden. I am not a lawn person. This is a job for my Dearly Beloved and he does love his lawn. He has been making noise about planting grass seed. We will see if that happens. Actually he mowed for the first time today. Our lawn only needed it in certain places but he got it all looking nice and even. It looks great. Well, there may not have been a ribbon cutting ceremony, but I think there should be an official portrait. I don't believe I've ever seen your lawn mower. Wait! He (She? It?) can come to the Hoe Down! I have a "Gentleman of the Lawn". He grumbles about it from time to time, but I know he enjoys seeing it done just right. He mows, he sows, he feeds, he sweeps and he uses really bad language when talking about grubs! Your flowers sre wondeerful! You should have taken a pic of the mower. I think you can see that forsythia not just from the street, but from space. That is a fantastic forsythia, Carol! And no, I'm not a lady of the lawn--lawn exists to be turned into garden, in my world. Happily, though, LSS is a gentleman of the lawn (and to borrow Layanee's phrase, equipment manager!) so he tends to that. And I 'take back the lawn' a little more each year. Bwah hah hah! I wouldn't be able to dig out my Forsythia monster either if I didn't have another one. Wait - I still haven't dug it out yet. It just started flowering. When it's done, then I'll get rid of it. Oh yeah, the lawn...DH actually enjoys cutting the grass, but I'm the one who cuts it on the diagonal. I enjoy mowing, but rarely get the chance since my guys always take care of that chore. My son mowed the backyard for the first time today. It was a wonderful spring day to be outside. And here I believed you on Twitter and fully expected there would be a blog post replete with pictures of the ribbon-cutting ceremony! 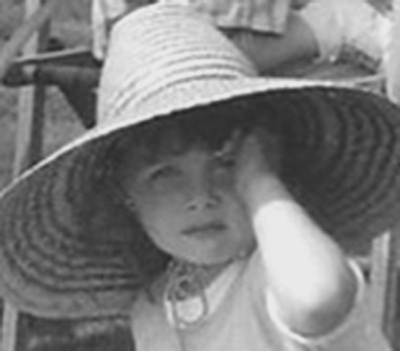 I like the hat you won at Spring Fling... just saw your photograph on Pam's blog. I had no idea what this white flowered tree was and I am SO glad you identified it for me! I was going to post it and ask for some help-thanks ahead of time! Star Magnolia. My better half likes to do the lawn, it's his "thing". In fact he sometimes will mow the neighbor's lawn if they are slack at cutting it (he can't stand an ugly lawn) In our small town he's well known for being "The lawn guy", it's kinda funny actually. My garden is about to give up the ghost. For the next 5 months I'll be drooling over all your gardens up north...so keep those photos coming. I suppose I would be a "Gentleman of the Lawn." Although maybe to go with the alliterative effect and to boost the egos of men everywhere we can call it "Lord of the Lawn." It kind of sounds like a gardener's spoof of Lord of the Rings. It's a great time to be out reflecting on everything in your landscape or about life in general. I agree it is great exercise! My husband is the "Lord of the Lawn" (great name, Dave!) because mowing is nearly a day-long job at our house. There's nothing that says summer like the first smell of a newly-mown lawn. There's a little less of the lawn each year since we bought this house in July 2004, but enough grows for me to remain a Lady of the Lawn. You looked so cute in the hat, Carol! And the Hellebore looks wonderful. Ladies of the Lawn! I love that. 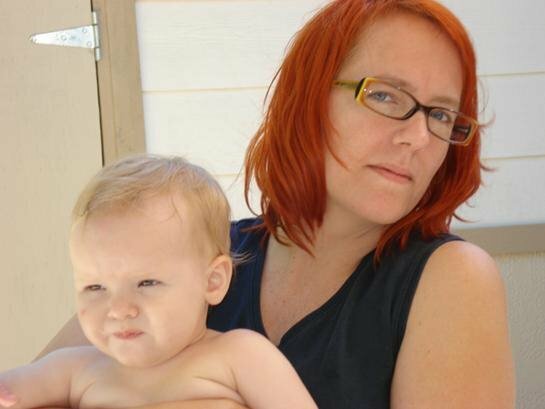 I haven't been to your blog in awhile and what an enjoyable read it has been today. A little lawn is the perfect foil for a garden bed. The Lord of the Lawn over here has a tendency to be too neglectful and the Liberated Lady of the Lawn now mows more often....and I can insure the safety of my garden plantings(well said..Annie). 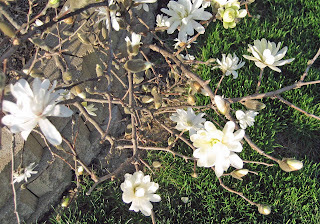 I love the Star Magnolia, smaells lovely, too. I used to enjoy mowing the lawn when I was home with the kids but then the EM decided he needed a 48" deck mower which I will not use! He likes equipment, the power kind, and I like mechanical. Anyway, love chionodoxa. Mine usually bloom on Patriot's day which is next Tuesday I think. 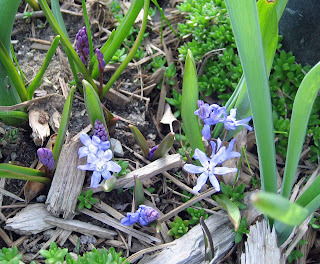 The running of the Boston Marathon and chionodoxa! Well, Carol, does it count as a ribbon-cutting ceremony if you're using an electric mower and run right over the cord? You know, I don't think I could ever get rid of my lawn entirely since I like having a nice green spot to rest my eyes, but I grew up on 5 acres of lawn that took 9 hours a week to cut (not counting the push mower around the many, many, many trees), so I think my lawn fatigue is going to last a few more years. If I can get my grass down to less than a half-hour to cut, that would be my ideal amount of lawn. Right now it's at a little over an hour with my electric push mower. P.S. To anyone considering an electric mower, get one with a battery pack! Otherwise it's uncomfortably like vacuuming your yard. Sorry, I'm terrified of lawn mowers. Watched my grandmother get her finger chopped off in one. And I leave it to Alfonzo, who mows all my neighbors' lawns. But I do understand the contemplative state it leaves you in. I feel that way about pulling weeds. Makes the troubles disappear! Carol, I think I would like to be a lady of the lawn. Unfortunately we don't own a lawn mower so I just don't know. Our lawn is over an acre of grass so we've always had somebody else cut it. Maybe when we retire and move from here I'll get myself one of those little electric mowers. wow... the forsythia and turkish glory are brilliant! the star magnolias in new york are in full bloom! i a truly enjoying the mild weather as well. All, thanks for the comments. I guess every yard has either a Lady or a Lord responsible for mowing the lawn. I'm glad I'm not alone in liking mowing. I am crossing my fingers that next week I will be Lady of the Lawn! The Lady gets cold fingers when it's 40 degrees outside (our weekend weather in Chicago). we just rent here, and our landlord was doing the mowing. but he turned over the key to the shed with the mower, and said we could do it, if we want to. i don't really care for it, but my partner is thrilled. guess you could call him a gentleman of the lawn. i also did not know what that beautiful white flowering tree was that i have been seeing around the neighborhood. star magnolia is a very good reason for gardening. awe inspiring it is.